To some degree I am a creature of habit and my menus depict this. The down side of this is that meals become predictable and the children are agitated by a change in routine. I do try to keep a degree of flexibility and novelty. Saturday nights tend to be international night, we might go Mexican, Italian (other than bolognaise) or often a curry. Curries are great as there are so many different varieties, a spicy Indian will differ greatly from the creamy coconut of mild Thai curry. I am a disciple of the Indian chef Gurpareet Bains author of Indian Superfood. Having been a follower of his for a while now I have found that the same few ingredients turn up through not only his meals but they are now creeping into the most mundane of my meals to spice them up slightly; Ginger, Garlic, Chilli, Nigella seeds, whole spices such as cumin, cardamon, turmeric, fennel seed, garam masala are all now basic cupboard essentials. What is even more important I use them all and they are replenished regularly so are always pungent and fresh. 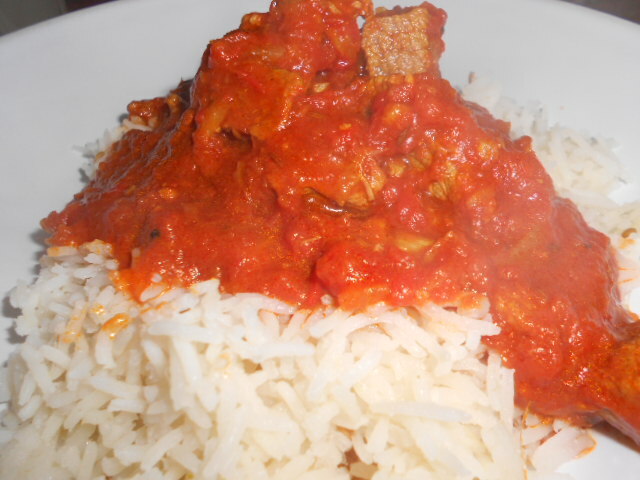 Here is my take on Gurpareet’s fabulous Rogan Josh curry. As you will know I am not an exact cook and foods get thrown in or amounts get changed to satisfy children’s tastes and reluctance to experiment, I have tried to give an idea of how much spice I used to feed a family of two adults and three children. 3x 400g of tinned chopped tomatoes – this sounds a lot but it leaves the curry with a depth to the richness and tomato does not overpower the dish. 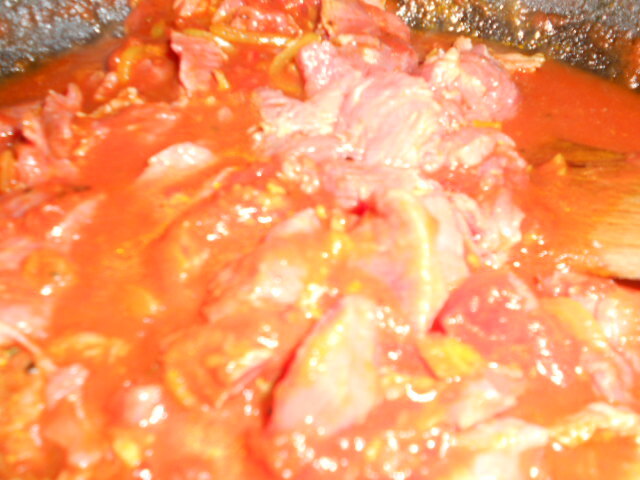 Diced beef – this can be swapped for any meat although the tomatoes and beef go particularly well together – if I was cooking for more people I would double the meat and up the tomatoes, depending on numbers I would up the other ingredients slightly. I have learnt the key to a good curry is to add the ingredients to a hot pan really quickly allowing the smell of the cooking spices to envelope you in a blanket of anticipation then leave it for a long time to allow the flavours to mix and develop. 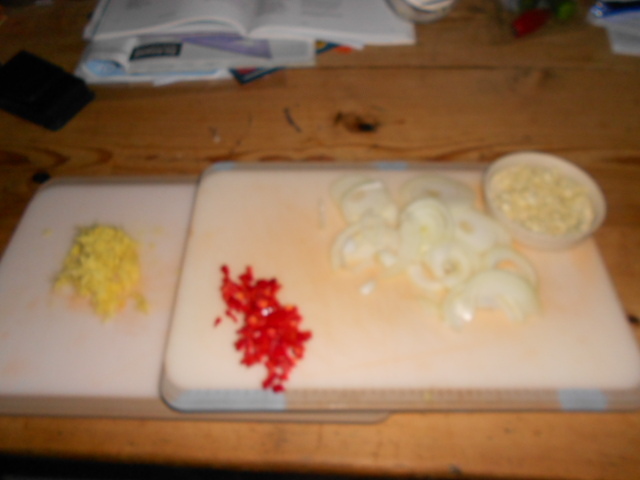 The only way to do this properly is to prepare all the ingredients beforehand and have them ready to add. Put the empty pan on a hot ring and allow it to start heating up. Turn the heat down as the oil goes in, (I find my instant touch gas brilliant for this but you will know your own cooker). 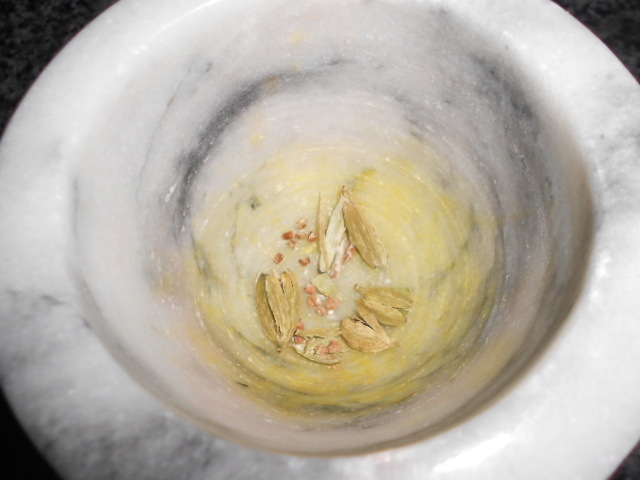 Add the cardamom, cumin and nigella seeds, stirring constantly. No more than 2 minutes then add the onion, again stirring constantly, allow this to soften and take on the flavours of the seeds. 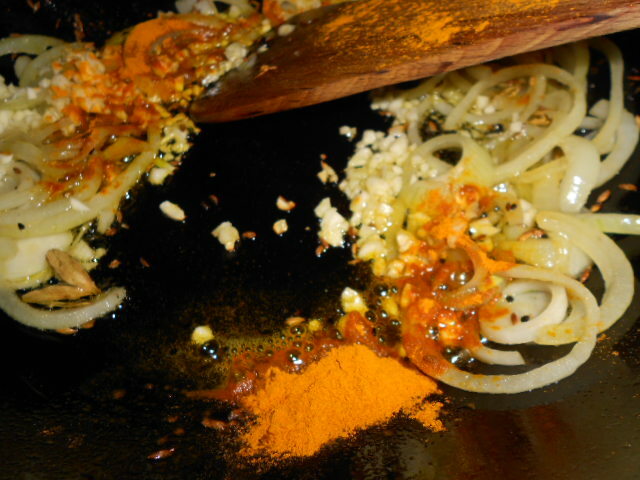 Sprinkle the turmeric over and add half the garam masala, keep stirring. At this point I added a tin of tomatoes and rinsed the tin with water, then added the ginger and chillies. Turn the heat up and allow the liquid to reduce and thicken, now you can just stir occaisionally. Add the beef or whichever meat you are using and allow it to seal off for about 5 minutes. Bring to the boil then turn down the heat to a simmer and leave uncovered for at least 30 minutes, stirring occasionally. Cover the pot and leave again for at least 30 minutes still remembering to stir now and again. It is at this point I begin the rice. I am lucky enough to own a rice cooker, not one you plug in, this one goes either in the oven or in the microwave. It is one of the few things I do use the exact timings and measurements for in my cooking as it has revolutionised my complete record of failure with rice. I put 330g of dry white basmati rice (4 adult portion) in the pot. Then add 550ml of boiling liquid over it. (there are two lines one for the rice and one for the liquid which I religiously stick to). However I usually spice up my rice and do not add salt by adding a stock cube instead. 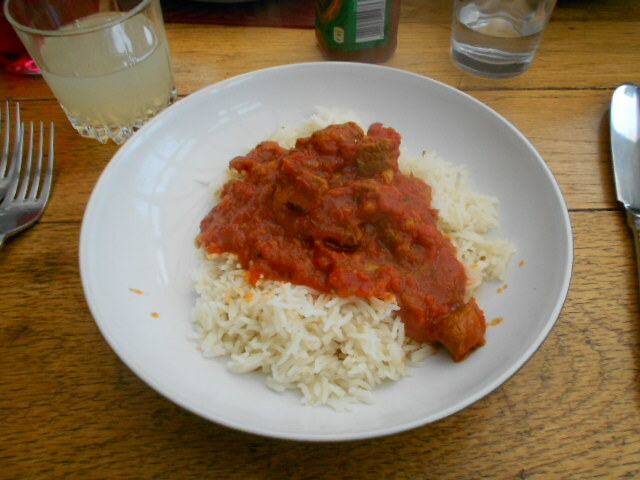 To serve with this Rogan Josh; I added a generous helping of whole cumin seeds and a chicken stock cube which I had crumbled over the rice. 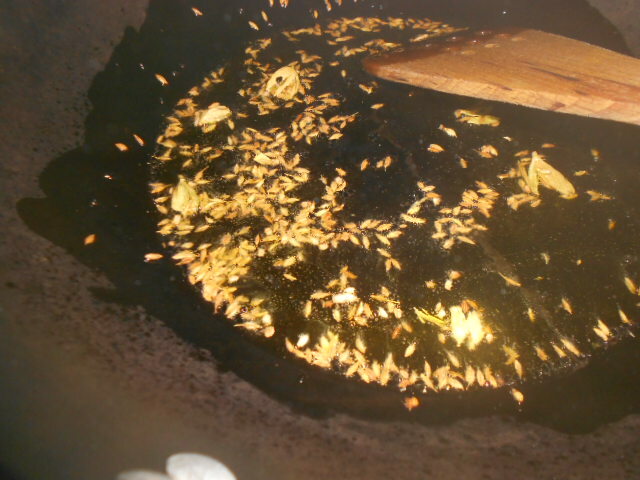 I then mixed the rice, seeds and cube before topping up with the boiling water. 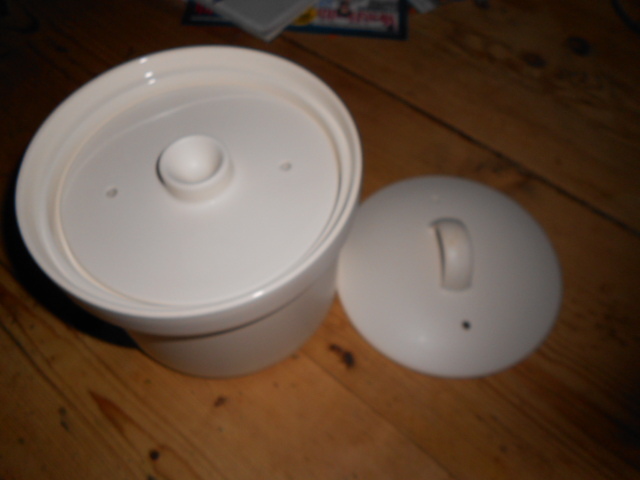 The pot comes with two lids the lower flat one with two tiny holes and the top with a slight dome and a handle also has two holes. 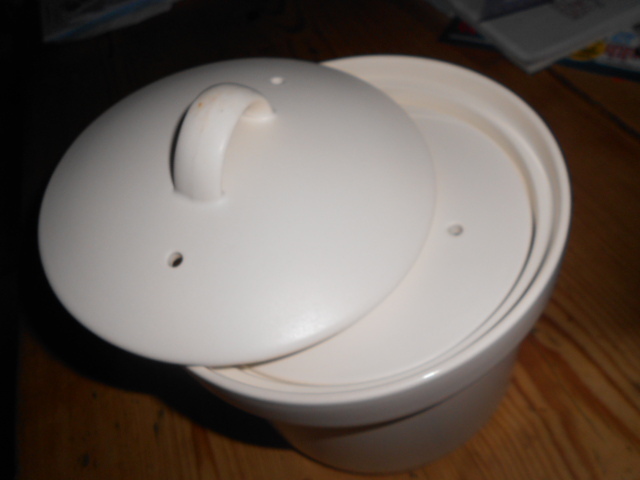 One lid goes on and the top one is added with the holes at opposite angles. Put it in the pre-heated hot oven for 17 minutes, I do actually use my timer for this. When the buzzer goes off take it out of the oven – and I put it on the table, again I set the timer for 10 minutes this time. I use this 10 minutes to pop in some Naan Bread and lay up the table with poppadums and chutneys and then call the family. As I bring the Rogan Josh to the table I added the remaining garam masala. I would also normally add a good sprinkling of chopped coriander but I had used it all up the night before. It gives a fresh cleansing flavour that compliments the curry so is not just a decorative herb. Despite the exacting method of making rice, it sounds complex but it is so easy to follow and the results are fantastic. Although I used all those strong spices the curry was not too spicy or hot; it is full of complimenting flavours and disappeared with seconds being helped on to plates. 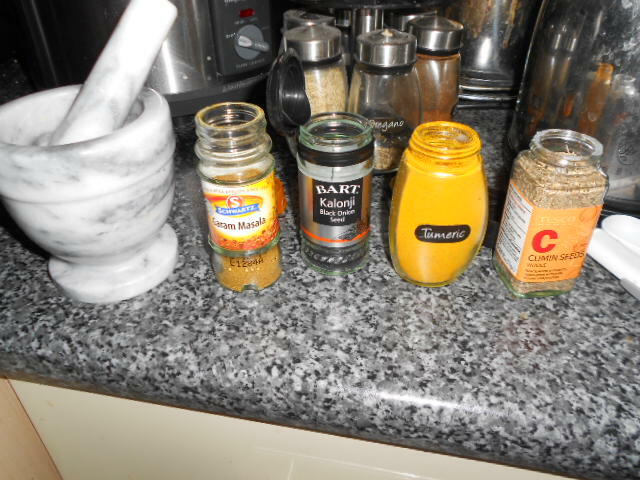 Enjoy – let me know what meat you use and what sides you like to serve with your curry.